My Mom loves to grow all sorts of things. Despite living in upstate New York, we had two peach trees in the yard that regularly filled our pies, mason jars, and tummies with buckets of perfect, juicy peaches. Last summer my Mom and Dad planted their first kiwi vines. Really. So for Christmas I got my Mom two moldy stumps. Purchased from GMHP out of Graton, California, they sell logs that have been inoculated with various edible mushrooms spores. Upon receipt, you just put the log on a damp sponge, cover it with a perforated plastic sleeve that helps to keep humidity in, and wait for your mushrooms to bloom! I wouldn't have believed this would work (or produce such impressive results) until after Carla's Mom picked up a kit this fall. 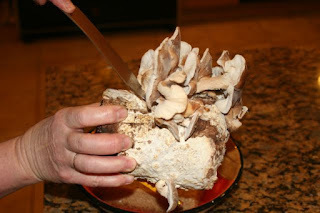 For Christmas, I got my Mom a shiitake kit and a blue oyster kit. 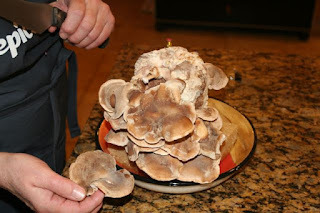 The shiitakes took off right away, but the oysters lagged about a week behind. 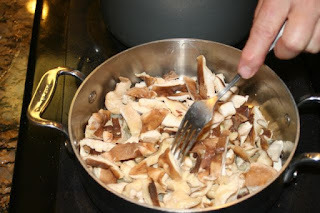 While I wasn't home to taste the results, my folks were impressed with the freshness of the mushrooms and their bold, woodsy flavor. It is great to have Culinary Pen back posting excellent tutorials. The 'shroom stumps were not only practical but interesting. Keep it going.